Correctly called Murcott after the original grower, Florida distributers considered this name unmarketable and changed it to Honey. 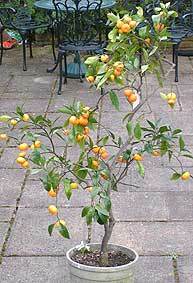 Probably a mandarin x orange hybrid. They have been promoted as 'the lowest acid, sweetest Tangerines available anywhere on earth'. However, this first fruit from my plant, picked late January, was decidedly sour. I shall leave remaining fruit to sweeten for a few weeks before trying one again. 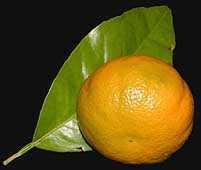 A New Zealand selection of the Australian 'Poorman Orange' it is is thought to be a mandarin-pummelo hybrid. 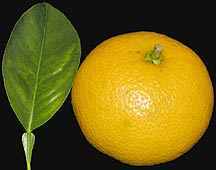 This parentage explains it's low heat requirement compared to other grapefruits, and also the orange coloured flesh. The fruit shown here was picked late January and proved to be an excellent breakfast fruit with just enough acidity. 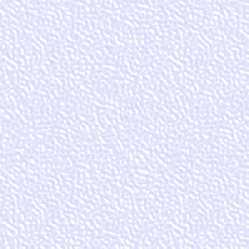 This variety was created in 1959 in Texas, USA, by irradiating seed of a Hudson pink grapefruit. It produces the reddest internal colouration of any of the pigmented grapefruits but can suffer from a variety of production problems. It is a favourite supermarket fruit with very little acidity. My small plant has never looked wonderful, with curling leaves which often drop. However it produced a single mandarin-sized fruit and I couldn't wait to pick it and see the inside. I should have waited! 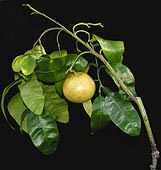 The thin-skinned fruit was pale orange-pink, and very sour. Perhaps it would have improved on the tree, but probably my conditions just don't provide enough heat to sweeten the fruit. This plant was purchased from the famous old nursery Rivers over twenty years ago. Although, the fruit are ready to eat in December or January, I usually leave them until the spring. By then they are not so good to eat, but still look very pretty!